A traditional orthotic patient assessment includes Observational Gait Analysis: In plain English, the orthotist will watch the patient walk and take notes. This type of assessment has significant limitations. The human gait is so complex and multi-dimensional, it is impossible to do a sophisticated assessment with just the human eye. In the past, clinicians have traditionally used qualitative descriptors to analyze gait. For example: “The patient pronates (rolls inwards) excessively”. But this shallow level of analysis does not provide nearly the same precision and accuracy as 3D Motion Analysis. In the Guelph Orthotics lab, we have a more powerful, more accurate, and more advanced solution. We attach nine sensors to your body, and these sensors wirelessly relay their relative positional data to our computer at a rate of 100 measurements per second. This kinematic data gives us a precise numerical description of how your body moves. This analysis helps us design an optimal device (brace or foot orthotic) to suit your needs, and then test how effective it is. Our high-tech approach provides a level of analysis that simply isn’t possible with traditional observational gait analysis. We offer our patients precise, accurate, quantitative assessments, such as: “The rearfoot reached 10 degrees of eversion at midstance and the center of pressure has moved medially 15mm with a pressure of 25mmhg under the 1st metatarsal head’. The difference between these two approaches is night and day. The other major limitation of observational gait analysis is the inability to measure the performance of a new custom orthotic. Observational gait analysis does not allow the clinician to see inside the shoe, which forces them to rely on assumptions and educated guesswork. 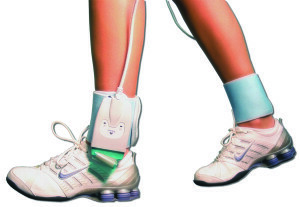 At Guelph Orthotics, we have an In-Shoe Pressure Measurement system that allows us to actually see inside the shoe. 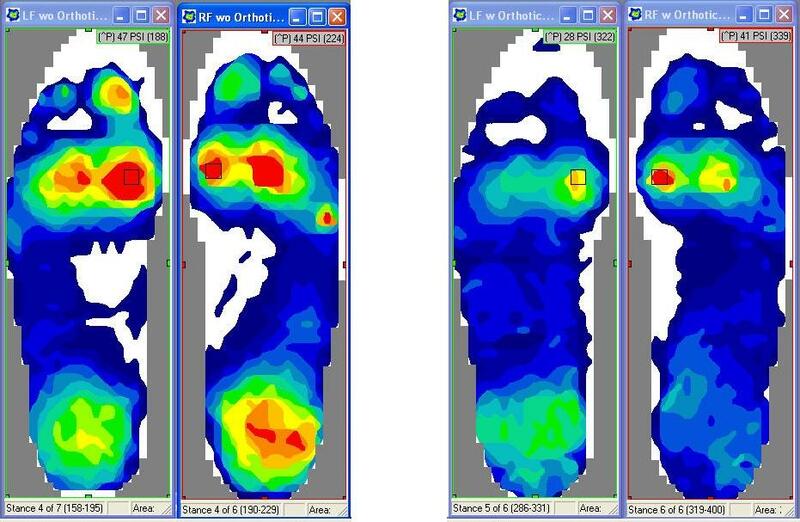 We can observe and quantify exactly how the foot is interacting with the shoe. We also use this as a way to measure the effect of the orthotic at the fitting to ensure we have achieved what we set out to do. The images below show an example. The images on the left show the pressure and movement of the centre of pressure without the orthotic and the images on the right show these details with the orthotic. The combination of the most advanced technology and our complete dedication to patient-centric care is what makes Guelph Orthotics the best choice for Custom Foot Orthotics, Orthotic Bracing, Orthotic Footwear, and other orthotic services for residents of Guelph and the surrounding area. Are you interested to see how our tech-forward approach to the assessment, measurement, and fabrication of orthotic devices can help improve your comfort and health? If so, we would love to sit down for an initial assessment and talk about how Guelph Orthotics can help you move, walk, run, play, live and GO. Give us a call at 519-341-0303 or book an appointment online here.